Unfortunately, it’s also one of the scariest. It’s a chart from the U.S. Census Bureau. It shows the centenarian population. A centenarian is a person aged 100 or older. 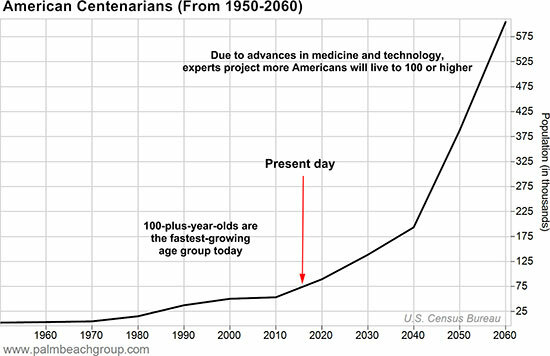 The arrow shows how many centenarians exist in America today. The curved line after it shows the explosion of the 100-year-old population in the years to come. In every developed nation worldwide (such as the United Kingdom, Canada, Australia, and Japan), you’ll see the same trends. Lifespans are increasing at an unprecedented rate. And the 100-year-plus age bracket is the fastest-growing group of people. All over the news you see billionaires buying gold, but behind the scenes, they’ve actually been making a fortune on a very different and unusual asset that has nothing to do with precious metals. See what the billionaires are buying, here. On September 22nd, the Chief Investment Strategist of Bonner Private Portfolio, Chris Mayer is making a major announcement. It has nothing to do with a market crash or credit crisis… but it could have a lasting impact on your wealth, and the wealth of your children and grandchildren. Details here. Right now, the U.S. has an estimated 72,000 centenarians. If the population of centenarians continues to increase at its current rate, the U.S. will have close to 500,000 people over the age of 100 by 2055. A sixfold increase from today’s numbers. Some of you reading this will live to 100. Many experts believe the first humans to live past 125 have already been born. Thanks to advances in medicine, diet, lifestyle, and hygiene, we’re living longer than ever before. And it’s only going to get better (or worse, depending on how you look at it). Living to 100 is an amazing prospect. It means more time with grandkids… more time with friends… more time to see the world… more books to read… additional hobbies to learn. That’s the exciting, incredible part of getting older in America. The scary part is paying for it all. Those additional years will also contain health care bills, food bills, electric bills, insurance bills, and dozens of other bills. That’s why one of your greatest concerns should be running out of money in retirement. Thirty years ago, the solution to money worries in retirement was relatively simple. There was no concern about the solvency of Social Security. Many corporations paid their retired employees pensions. Back then, you could put your saved money in safe corporate bonds that paid over 9% in interest. Even short-term government bonds paid over 6% in interest. These days, the solvency of Social Security and just about every government program is in question. Pensions from corporations have all but disappeared. And with interest rates near zero percent, government bonds yield less than 2%. Add to this the coming volatility in the stock market as The Great Unwinding unfolds. The risk of running out of money because of all these factors is real… and growing. It’s perhaps the scariest time to be a retiree. I don’t think many see it coming. And I don’t see many people preparing for it. Now, most people are counting on Social Security to bail them out. After all, with Social Security, you get steady, consistent income not tied to volatility in the stock market… for the rest of your life. But if you rely, or will rely, on Social Security for a big portion of your retirement income, it’s time to start paying close attention. With increasing life expectancy rates, I have serious concerns many retirees aren’t taking their financial futures into their own hands. And that they don’t have another plan in place. If this sounds like you, don’t lose hope. A longer life is a blessing. And no matter how unprepared you may feel at the moment… there’s still time to set yourself up for a fulfilling, worry-free retirement. But you must start taking the right steps to prepare. Editor’s note: For years, retirees have relied on three main sources of income: pension plans, Social Security, and personal retirement accounts such as 401(k)s.
To help you protect your wealth, Tom and his colleagues have put together a first-ever Retirement Rescue Roundtable. 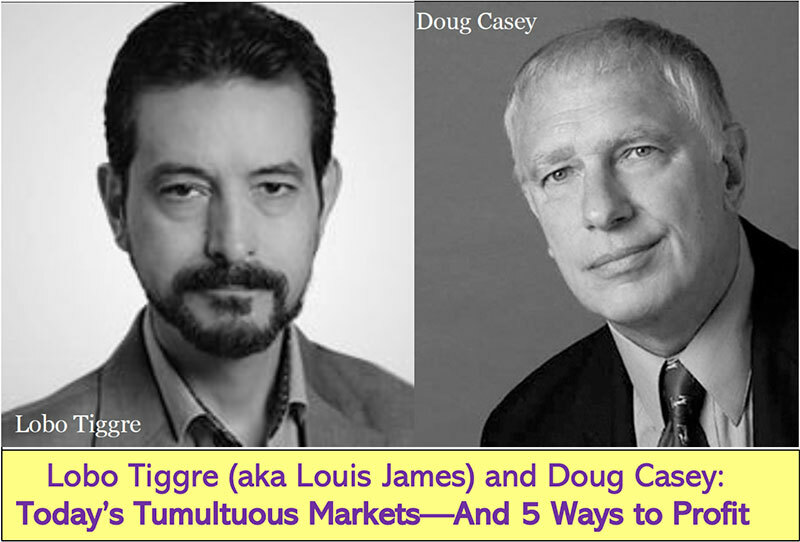 Their entire team of experts will be there—including Doug Casey’s longtime friend and colleague, Mark Ford. 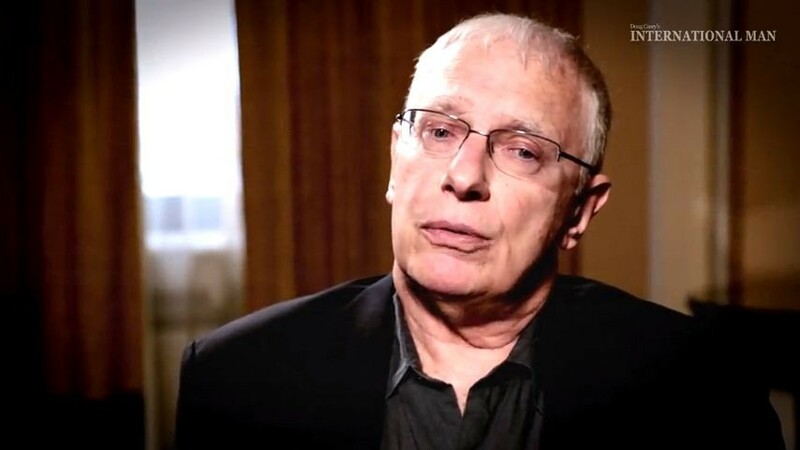 To learn more about Tom’s retirement strategy, click here to watch this free video.